In a mixing bowl, combine a package of ground beef 80/20, Italian seasoning, powdered garlic, powdered onion, some bread crumbs, salt/pepper, 1 egg. Mix it all up (he used his hands). Make them into golf ball sized meatballs. Brown them in a fry pan. Remove the meatballs and drain the fat. (But don’t drain the fat directly into the plastic lined garbage can if there’s nothing else in the garbage! He did that tonight and it melted the plastic and there’s a mess to clean up in the morning. Normally, he will pour it into the garbage, but there’s usually already garbage there to pour it on top of!) In that fry pan, put a can of marinara sauce (we have Trader Joe’s), crushed red pepper (use more or less depending on spice level), oregano. Get it bubbly. 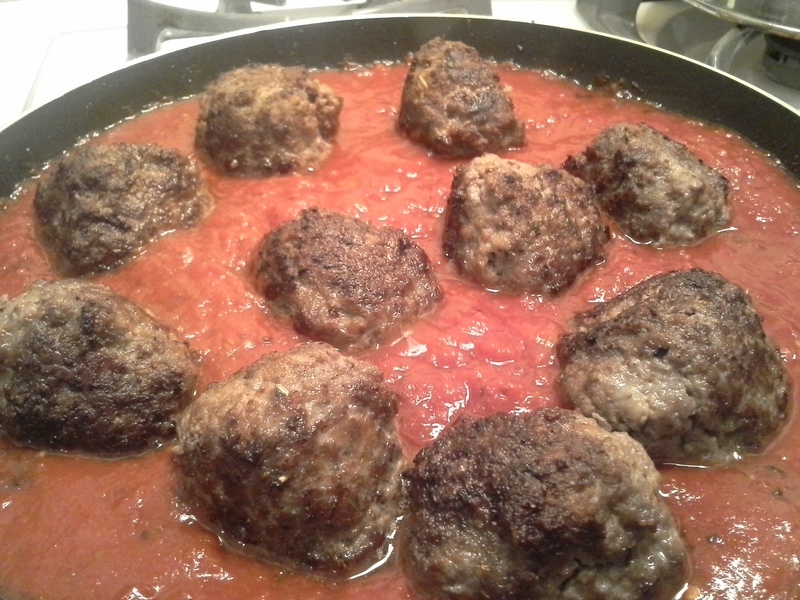 Add the meatballs to that sauce in the fry pan, let simmer and cover for a little while. 10 minutes or so. 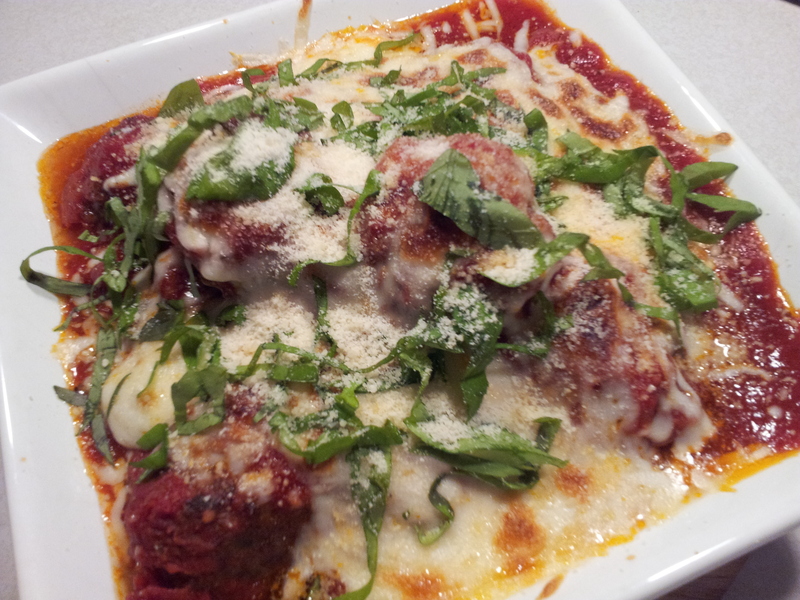 Put the balls in an oven safe serving bowl, pour sauce over, then shred some mozzarella cheese on top. Put them in the broiler in the oven just long enough for the cheese to melt and maybe get a little brown, and keep an eye on it – turn on the oven light and watch it. Just a few minutes. Take it out and put basil on it. Serve and enjoy. Ground beef – a package. They’re usually between 1 and 2 pounds. He used 80/20 just because that’s what we have.